The Grandland X crossover will be Vauxhall’s first plug-in hybrid, utilising technology from parent company PSA Group, suggesting Peugeot, Citroen and DS could offer similar products in the near future. 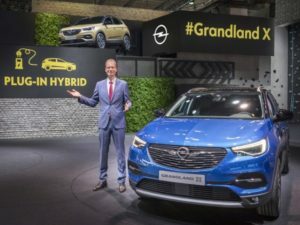 Announced by newly-appointed Opel/Vauxhall CEO, Michael Lohscheller, at the Frankfurt Motor Show, the Grandland X – the brand’s first competitor in the Qashqai-sized crossover segment – arrives this autumn, based on a platform shared with the Peugeot 3008. It’s the result of a technical partnership which dates back to 2012, rather PSA’s recent acquisition of the two brands. Although details are limited, the plug-in hybrid version is likely to use PSA’s plug-in hybrid drivetrain technology, which is due to debut in 2019. This will offer an electric range of around 40 miles, and 40% fuel efficiency improvements compared to a (petrol) combustion engine. The Group said last year that it has plans for seven plug-in hybrids and four electric vehicles by the end of 2021, though that wouldn’t include models launched under the Opel and Vauxhall brands. Launching this technology in the Grandland X suggests the Peugeot 3008 and production versions of the DS 7 Crossback and C5 Aircross could feature something similar. “Our new Grandland X as plug-in hybrid is the next big example of the opportunities that await us as a member of the PSA group. We will follow this path closely,” said Lohscheller. The Grandland X will be Vauxhall’s first plug-in vehicle since the Ampera, a range-extended electric vehicle which was discontinued in 2015. Vauxhall has yet to confirm a version of the Ampera-e, a long-range pure electric vehicle, for the UK market.